Uttar Pradesh Police has grabbed the news headlines for various reasons but this time UP Police has won the hearts of everyone for saving lives of three by averting a major accident on the highway. 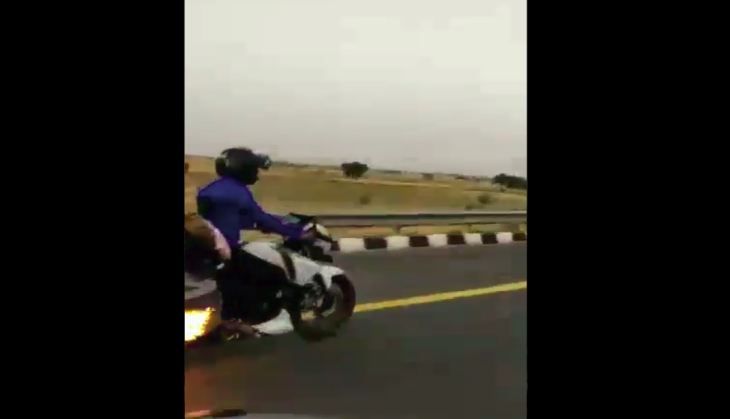 Recently, a video is doing the round on the social media in which Police van was chasing a bike which caught fire on a highway in Etawah. However, bike rider didn’t aware that his bike has caught the fire and hence, he was running it on the normal speed. When UP Police noticed the fire then, immediately police came to action and tried to chase the bike to douse the fire. Even police turned the siren and gave chase to the bike on the highway. In the video, policemen were also shouting to stop the bike rider. However, the fire was caught in a bag that was attached to the bike. Thanks to Up Police that none of the riders on the bike were injured. The social media users also applauded UP Police for giving help on right time.